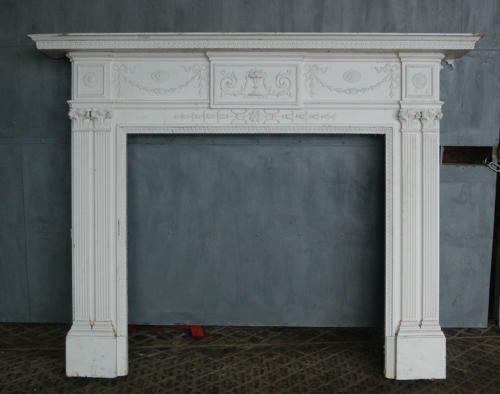 A very ornate, George II style, painted wooden fire surround. This large surround is probably Victorian and has an abundance of style with a beautiful design. The fire has a design typical of the Adam Style, copied by the Victorians, with swags, bows and urns. The legs have Corinthian style colums with flower finials and heavy base. The fire opening and under mantel has decorative borders. The fire has been well constructed and fully useable. There are two metal lugs attached to the back of the fire for wall mounting. As an antique, the fire has some signs of wear and slight damage. The front edge of the mantel has some knocks and chips and there is some slight damage to the side of one leg. There is residue paint attached to the sides that will need removing by purchaser and there are chips and peeling to some areas of the paint. Some scratches and marks are present. Purchaser may wish to strip and repaint the fire to suit. A beautiful item that is ideal for a living or dining room due to its size. The fire surround has a stunning period look and would add fantastic style and interest to a home.